Examine the bottles on display at any of Delhi’s banta shops and you’ll see evidence of a remarkable pan-Delhi operation. Banta is the colloquial term for a peculiar kind of lemon soda sold in the city—packed in distinctive, green-tinged, Codd-neck bottles locked in place by a marble, and embellished with ice of dubious origin and generous quantities of black salt. Banta stalls are a common sight in Delhi’s suburbs—an operation consisting of lines of bottles with lemons perched on them, a thermocol icebox and a crate of glass tumblers. They are priced between Rs5 and Rs20, and a well-placed stall near a Metro station can sell up to 70-80 bottles in a day. 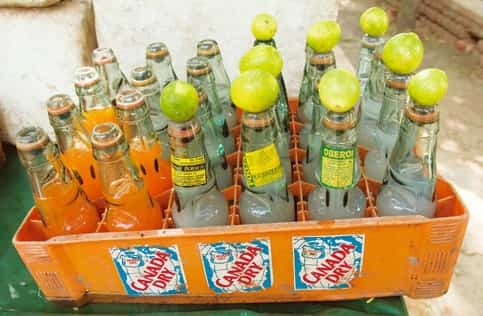 At one such stall on Chhatra Marg, in the Delhi University campus, many of the bottles come from a one-room bottling operation located deep inside the north Delhi colony of Vijay Nagar. Some come from a similar outfit buried inside a warren of flats in Mehrauli, in south Delhi. Others come from Anmol Lemon, which flanks a row of hardware shops on Bhogal’s Masjid Road, near Nizamuddin. The banta supply chain, so to speak, supports a number of interconnected cottage industries. The story starts, strangely enough, in London in 1872. That year, a British engineer named Hiram Codd patented a kind of bottle designed specially for lemonade and other fizzy drinks. The bottle dispensed with the need for a cork or cap by enclosing a marble in the bottleneck. The effervescence generated by the fizzy drink forced the marble up the neck, locking it against a rubber gasket to form an effective seal. Opening the bottle, a remarkably satisfying process, involves pressing down on the marble, which releases a jet of soda and liquid (like a cartoon whale in fast-forward) and a sound like an implosion. The Codd bottle (considered an improvement over the bowling pin-shaped “Hamilton" bottle, which tended to slip easily and roll off surfaces) became standard across the British empire. These bottles, prized as collector items, can now be found only in two places—in India, for banta, and in Japan, for a curiously similar lemon drink called Ramune. All of India’s Codd-neck bottles come from a single factory in Sasni, Uttar Pradesh—Khandelwal Glass Works Ltd. “We’ve been making Codd bottles since 1981," says managing director Sanjay Jain. “There was one other factory back then, Mahalakshmi Glass Works in Hyderabad, whom we competed with—but they stopped a few years ago." The company supplies mainly to Delhi, Punjab and UP for banta and the southern states of Tamil Nadu and Andhra Pradesh for panneer soda, a local variant flavoured with rose essence. “Because of Pepsi and Coke, our business is going down," Jain admits glumly. At its peak in the 1990s, the factory shipped around 100,000 bags per annum (a bag consists of 75 bottles). That figure has now dropped precipitously, to “less than half". 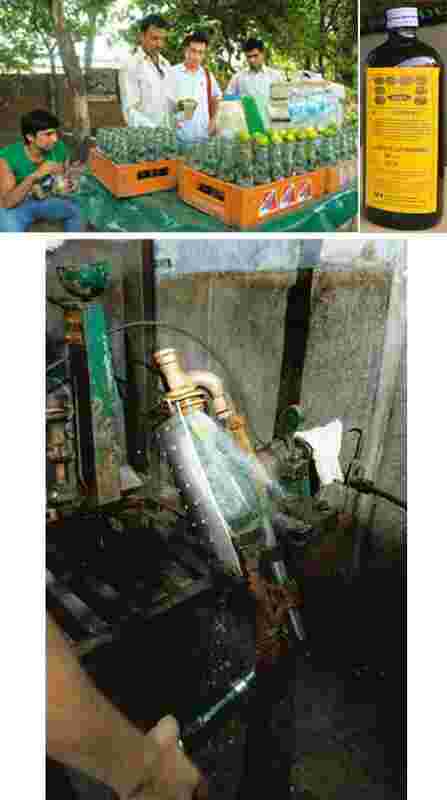 “Our raw material is costly, and making the bottles is challenging. They cost much more than your ordinary soda bottles," he says. A single Codd bottle retails for Rs12 in Delhi, compared with an average of Rs3 for an ordinary bottle. Why, then, are the banta bottles still favoured? Jain’s answer is strange. “These bottles are iconic. They may not be for ‘hi-fi’ people who go to malls—but the common people identify with this. It’s more natural, more fizzy, more refreshing." The focal point for the distribution of these bottles in Delhi is a street behind Novelty cinema, near the Old Delhi Railway Station. A row of baking goods suppliers line this narrow stretch, a path fraught with loose construction material and a snaky queue of cars attempting to make an exit. We visited Thakur Bros., which sells the two vital elements of banta production—the Codd bottles, and an enigmatic chemical flavouring agent simply called Lemon No. 1. “This (flavouring agent) is used in a lot of places, from ice creams to pharmaceuticals," says proprietor Manish Thakur. Manufactured by International Flavours and Fragrances (IFF), a multinational corporation with annual revenue of around $2 billion (around Rs9,200 crore), a 500ml bottle costs Rs283, and can flavour around 150 crates of 24 banta bottles each. “We do about Rs50 lakh worth of business per annum with this product," he says. Thakur also offers a more reasonable explanation for the Codd bottles’ continued popularity. “It’s almost a culture, in a way. It’s an established chain that has lasted for very long." His family, which moved from Multan in Pakistan to Delhi after Partition, used to sell banta in Old Delhi in the 1950s—made on soda-making machinery mounted on horse-drawn carriages. About 100 or so single-room bottling operations located throughout the city buy the bottles and essence from here. Most are not the epitome of hygiene and cleanliness. Oberoi Lemon, located deep within the bylanes of Vijay Nagar, hides behind a set of rusty double doors next to a small department store. There’s a man in semi-naked repose on a charpai (bed) near the entrance, barking supply orders into his mobile. Sacks of sugar are lined against the wall like sandbags, framing two large vats in the centre of the room. A transistor is placed precariously on an upturned bucket, and blares old Hindi songs. Towards the back, oxygen cylinders are propped against racks of Codd bottles, and the bottling machine is consigned to a small corner flanked by a black Sintex tank. “We take a Rs500 deposit from every banta seller to deliver a crate of 24 bottles. We collect them in the evening, clean and refill them, and deliver them again in the morning," says caretaker Shubhkaran. The vats are filled with sugar syrup, and a 50ml measuring cup is filled with a combination of Lemon No.1 and sugar, and poured into each bottle. There’s no exact science to this measurement, which is probably why each bottle of banta tastes slightly different. The bottles are then placed in the bottling machine, which resembles a cross-section of a valve, covered with a perforated metal sheet. There’s a pleasingly steampunk wooden handle on top, which feeds the bottle with soda, and flips it around once, locking the marble in place. Every morning, around 9, Shubhkaran and his crew load the crates of refilled bottles into a tempo and take them to the shops. The shops themselves are indifferent to how this chain operates, and merely fork out the cash to get their bottles. Not many are interested in scaling up. Among the few to take supply chain matters into their own hands is the famous Ved Prakash Lemon Wale in Chandni Chowk. At a little hole in the wall near Town Hall, co-owner Chand Behari runs his own bottling and refilling operation, which keeps his incredibly popular retail operation well stocked. At 4pm on a Friday, there’s a healthy crowd milling around his shop. “You got me at a good time," says Chand Behari, handing out bottles of banta to the unending queue of customers. His hands seem to move of their own accord—picking out a bottle, opening it, adding black salt, handing it over, and placing the money in a metal box—as he speaks. “It’s just rained, so the crowd isn’t all that much." Behari is the closest one can get to an expert on the history of banta—his family, he says, has sold lemon-based drinks in various forms since the 1870s. “Back then, it was sherbet in earthen pots. “Our shop," he gestures grandly, “was much larger." Behari says the Codd bottles were used since the early 1900s, when they were shipped from England. Local manufacturing facilities took over after independence, with factories in Ahmedabad supplying Codd bottles nationally. His shop does brisk business, shifting around 100 crates of banta every day, and the drink’s popularity, he says, will “not go away". “What’s more refreshing (and inexpensive) on a hot summer day, I ask you?" he says. Behari is a fount of banta trivia, and he says the drink has survived much worse in its long history. Case in point, his fascinating story of how banta contributed to the freedom struggle. “The bottles were actually banned sometime before 1947 in many cities," he says. “Rioters and protestors used to put chuna (calcium hydroxide) in them and used them as improvised cannons."